I confess that I painted these ages ago but failed to prepare a post. The 2nd KGL Light Battalion needs little introduction. It was in Colonel Baron Ompteda's 2nd KBL Brigade and formed the core of the La Haye Sainte garrison at Waterloo. The KGL battalions were understrength in the 1815 campaign because experienced troops had been stripped out to join newly raised Hanoverian units. This resulted in KGL battalions having 6 companies rather than 10 - 4 centre companies and the standard 2 flank ones. The line battalions had a couple of uniform distinctions from their regular British counterparts, which I will discuss when I post about the 5th Line Battalion. The 2 light battalions had similar uniforms, but with different headgear and a few other distinctions. Major Baring's 2nd Light Battalion, 463 officers and men, was stationed in the farmhouse (so about 23 figures at 1:20). It was reinforced by companies from the KGL 1st Light Battalion and 5th Line Battalion and the 2nd Nassau Regiment. The story of the La Haye Sainte defence is too well known to warrant comment here. Suffice to say that the battle was hard fought and the battalion lost half its number. It was after 6pm, when the men had run out of ammunition, that the garrison was forced to abandon its position. Major Baring was one of the last men out of the farmhouse and related how those left behind received short thrift from the French, who were keen to avenge the losses they had suffered trying to invest the position. It was to assist the fleeing garrison that the Prince of Orange and the divisional commander Sir Charles Alten ordered Ompteda to march the 5th and 8th KGL Line Regiments in line towards La Haye Sainte, with disasterous consequences. 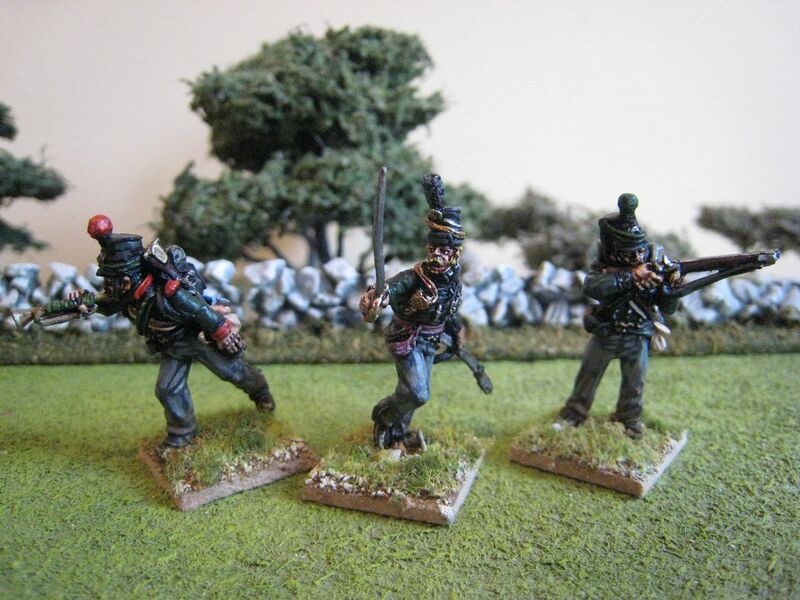 These three Perry Miniatures packs give you 18 figures, a few less than the 1:20 requirement. I did think about buying another pack to make up numbers, but decided that it probably would be difficult on the tabletop to squeeze 23 figures into a scale model of La Haye Sainte. 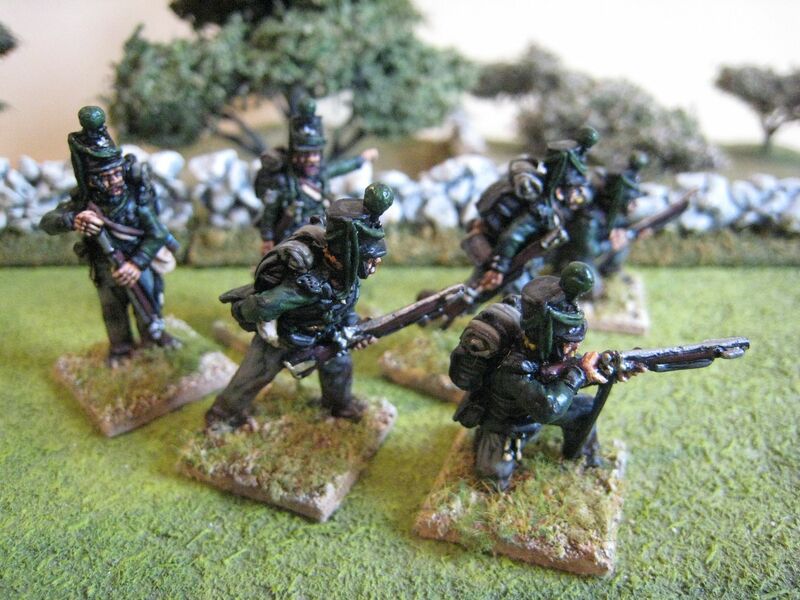 Centre companies had muskets whilst the flank companies carried rifles. 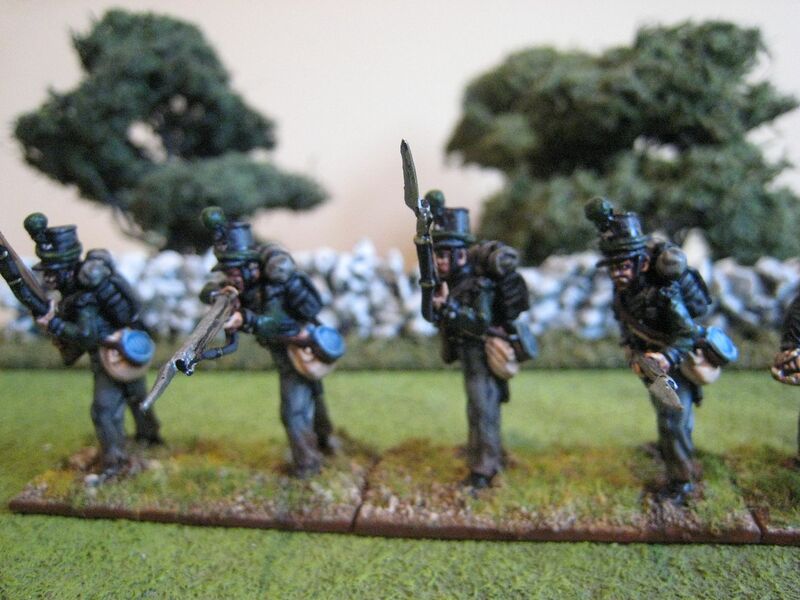 The Perries give you 1 pack of firing line figures with muskets and 1 pack of skirmishing figures with rifles. The command pack has 2 officers and then buglers and NCOs who all have rifles - you don't, therefore, have any command figures suitable for the centre companies other than the officers. 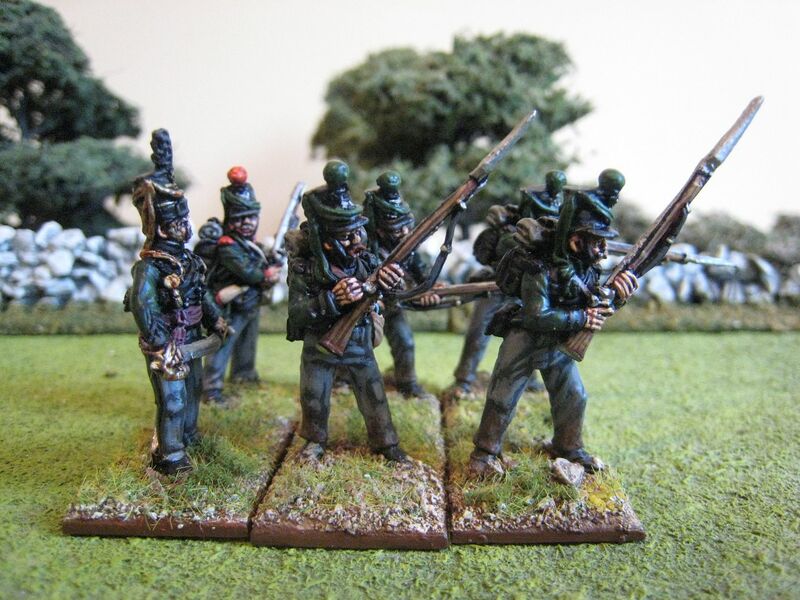 My unit consequently has too many rifle-carrying figures; I should really add another pack of musket-armed infantry but as stated above I think 24 figures would be too many for the scale size of the position (especially once you add the Nassauers and other reinforcements). With that position in mind, I decided to base all the "skirmishing" figures on single bases and the centre company musket-men on standard 2-figure skirmish bases. 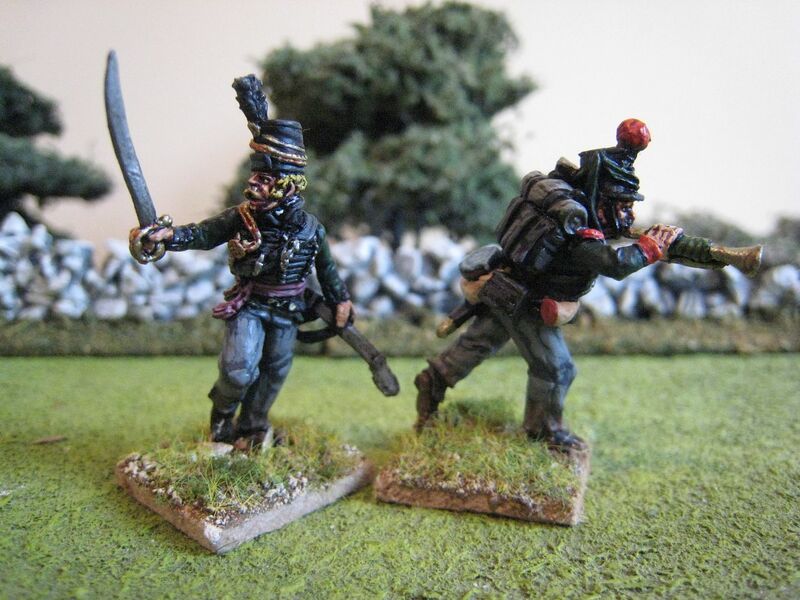 The uniforms are similar to those of the 95th Rifles, albeit with different headgear. 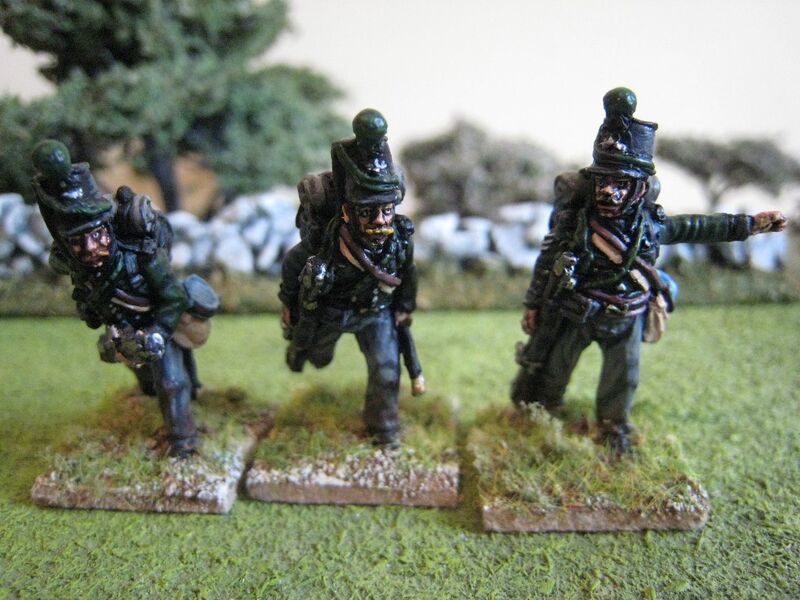 I used the Foundry "French Chasseur a Cheval Green 71" palette for the tunics, with sparing use of the final highlight to ensure the uniform remained quite dark. One uniform distinction I found in Mike Chappell's excellent Osprey MAA books on the KGL is that the musicians had red collars and cuffs. (Incidentally, I also have the very old Otto Von Pivka MAA book on the KGL in a rare hardcover binding, which includes a long passage quoted from Baring's recollections of the La Haye Sainte battle.) 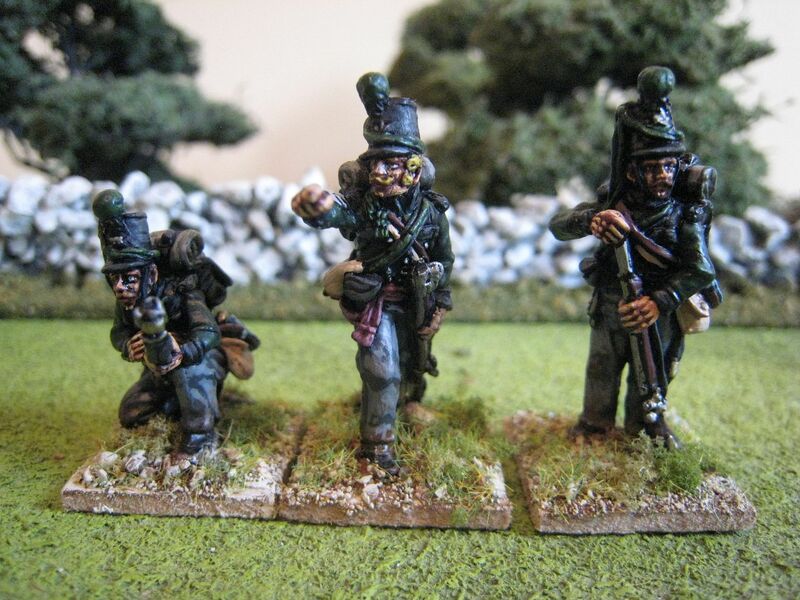 These are nice figures, quite fiddly to paint but pretty dynamic and with interesting uniforms. Perry have just released a pack of mounted light infantry officers which includes a KGL figure; I am awaiting receipt of that and will paint the KGL chap as soon as it arrives. I have the light company of the 5th KGL line already finished and I'm tempted to paint up a couple of Nassauers. Then all I will need is a model of La Haye Sainte itself! I'm sorry for the lack of posts of late, simply a result of too much other stuff to do. My painting time has shrunk and I'm not sure that weekly posts will be possible in the future, but we'll see. I'm trying to complete 8 figures a week but that is going to be a struggle. 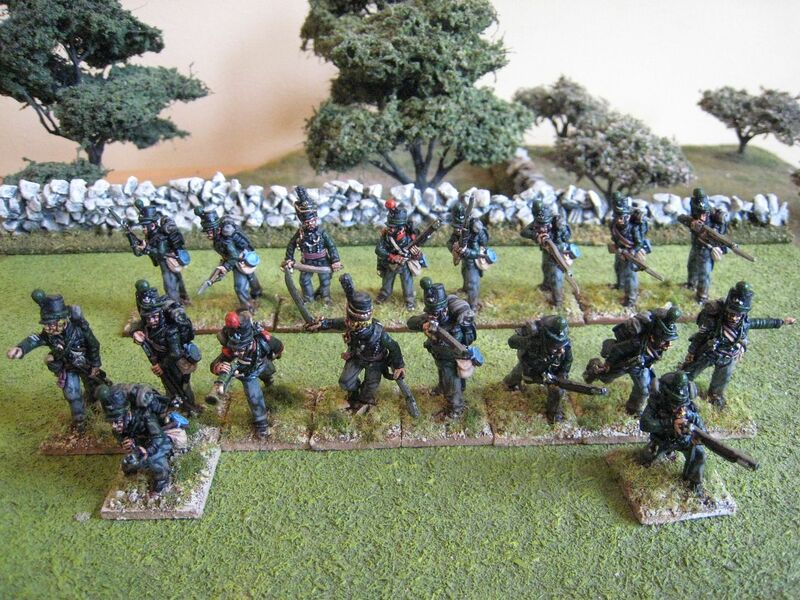 I'm currently working on the KGL 5th Line Battalion and have some AWI and Carlist War units half-finished. 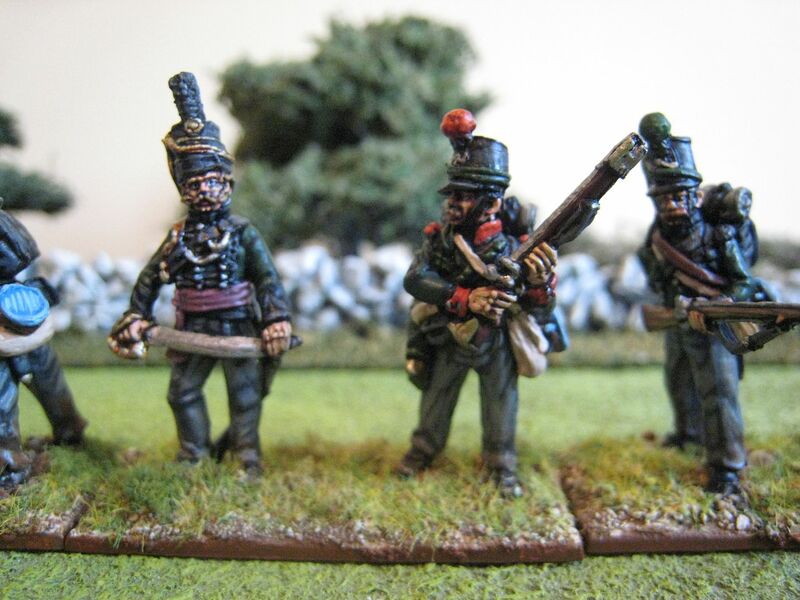 I'll try to expedite the completion of those, following which there are more French Napoleonics and AWI cavalry to do. And what's this I see...plastic Zulus? 18 figures. Painted September-October 2011.